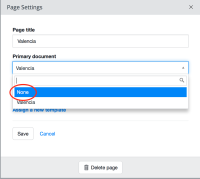 In the Page Settings dialog you cannot set the primary document to None after you have choosen a document before. Result: the primary document is not removed and the hst:relativecontentpath property on the sitemap item node remains. (Although the CM thinks you made a change that you can publish).